Authentic Bue Angels markings in the choice of three important scales. 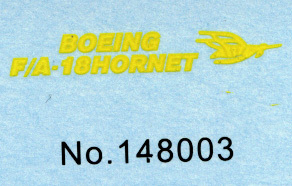 The latest releases from this Shanghai, China based producer, are three sheets covering the F/A-18 Hornet in the livery of the United States Navy’s flight demonstration team, the Blue Angels in 1/144 (144001), 1/72 (172005)and 1/48 scale (148003). 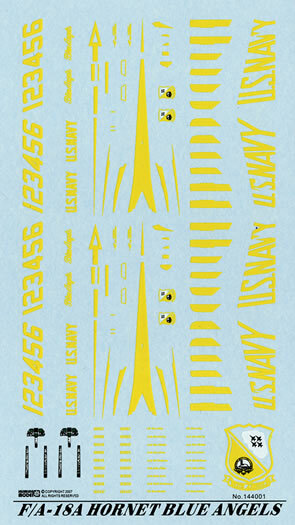 Enough markings are provided on the 1/144 scale sheet to enable you to complete two models whilst the 1/72 and 1/48 scale sheets provides markings for just one machine. All sheets carry all of the squadron’s aircraft Bureau numbers as well as “plane in squadron” numbers and pilot’s names. No advice is provided as to what pilot flew what aircraft, what “plane in squadron” number was on what airframe (Bureau number wise) or what season the decals represent. 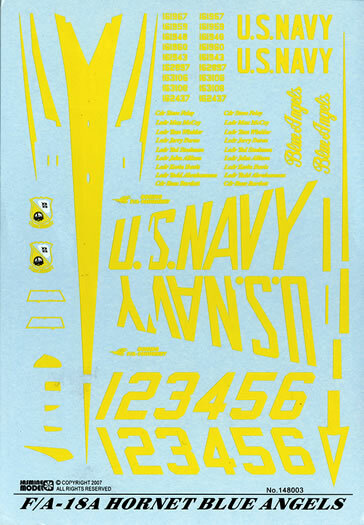 Both the 1/44 scale and 1/72 scale sheets also give you decals for the side consoles and instrument panels - two sets for the 1/144 scale sheet - but no advice is provided as to which kit these are sized to fit as well as a bonus single large Blue Angels squadron badge which would be ideal to apply to a display base. The decals themselves are silk screen printed and glossy. 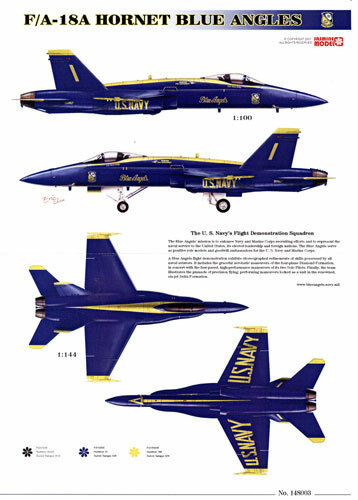 The yellow used looks to be true to the original “Blue Angels Yellow” and the markings look to have been printed on top of a white background. This makes them a little on the thick side but will ensure that they will be opaque when applied over the airframe’s dark “Blue Angels” blue background. Everything on my sample sheet is in perfect register with a minimum of carrier film. To be truthful, I’m not all that impressed with the decal placement guide. This is an on-going gripe with me as I expect a placement guide to do just that – show you where each decal is to be applied and these ones don’t! They are very small at 7¼” x 10¼” and carry full colour left and right hand side profiles and upper and lower plan views. I would also have expected to have information on what pilot name to apply to what airframe but sadly, it is not provided. 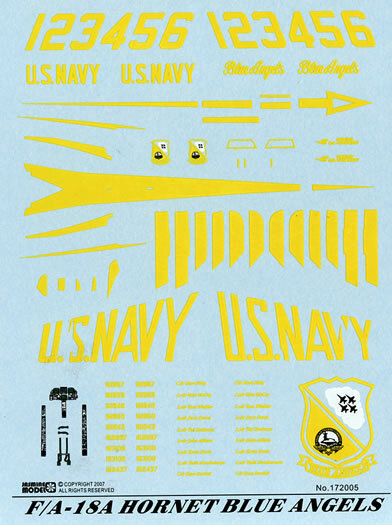 The placement guide and decal sheets (there are two in each scale – a large one and a tiny one that carries a second Boeing F/A-18 Hornet logo – are packed in a thin cellophane bag with a gummed strip to seal it. These bags are a pain as it is neigh on impossible to re insert the decal sheet, the waxed paper protective sheet and the cardboard backing/header card back into it without the gummed strip sticking to something! However, my gripes aside, Jasmine Models Blue Angels Hornets sheets are affordable and will do the job for you so long as have alternative reference so as to overcome the inadequate placement guide. Thanks to Jasmine Decals for the review sample.